MOBAs were born from modded RTS. And with nearly ever obvious faucet of the MOBA explored, it’s becoming harder and harder to stand out on the market from the existing juggernauts. 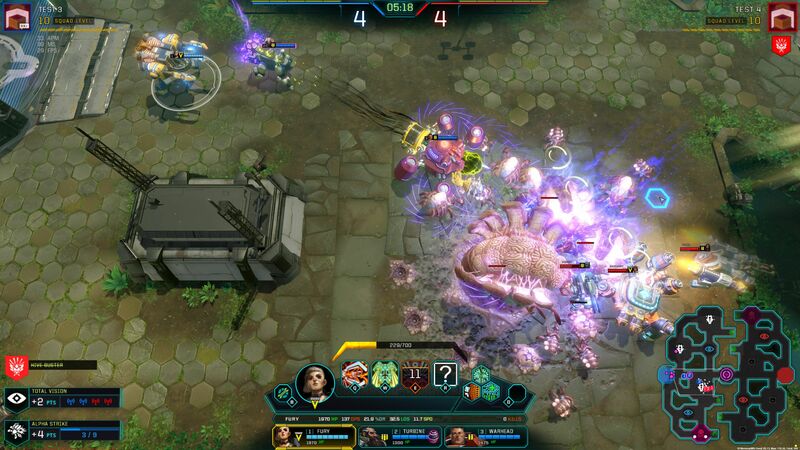 Within the last year we’ve seen a rise of oldschool RTS fans trying to revive the old by infusing with the blood of the new, creating a MOBA RTS hybrid. Personally I’m a fan. But admittedly I’m also in a small minority, as so far no stab at the merged genre has gained any decent sized following. One would think it simple couldn’t be done. 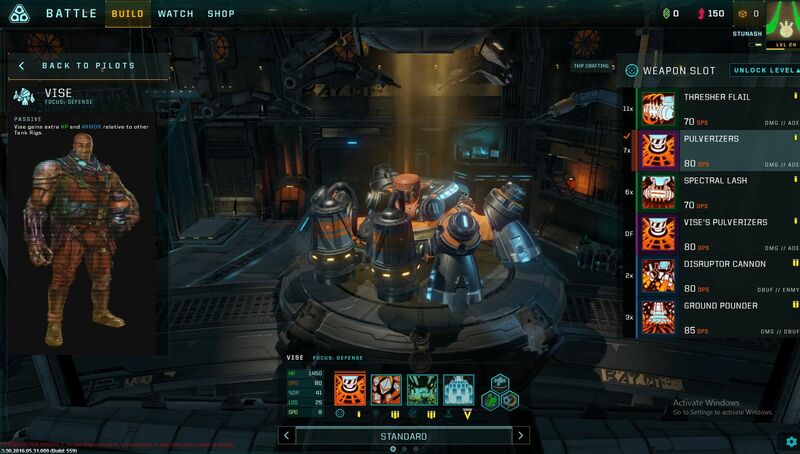 But Sparkypants Studios, packing some of the most legendary talent in the strategy and RTS world of gaming, aren’t willing to settle for this defeat. 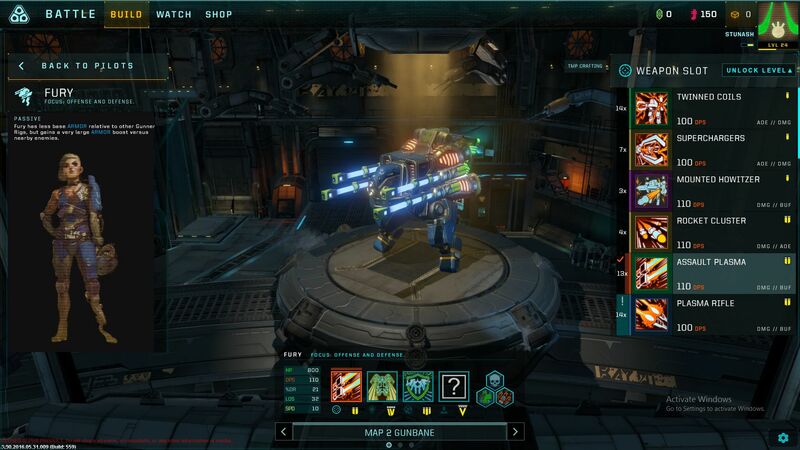 At E3 2016 Gameforge invited us to a private preview of their latest publishing project, Sparkypants’ Dropzone. So let’s get straight to it, why can Dropzone succeed in this non-existent market? Well for starters, they’re leaning far more heavily into the realm of RTS than any of the others have tried. They have a set design goal of making Dropzone accessible for the uninitiated, with quick enough matches (15 minute time limit) that even the most time strapped gamer can hop in. Furthermore they are doing away with the most toxic element MOBAs have to offer, teammates. Now the whole team is under your command; your victory or defeat falls on no one’s shoulders but your own. With three characters at your command, and a team shared experience system, all the power is in your hands. Which means APM super maneuvers have arrived in the world of MOBAs, as a true mastermind will unleash their 3 pilots across the map to tackle multiple objectives at once! Players queue up for head to head battles with their team of 3 pilots. The map currently in testing sets them down in the dropzone at the polar ends of the map – that is east and west. The focus here is not about killing the enemy. Experience is not rewarded for kill camping each other, meaning all you have to gain from downing an enemy is sending one of their units into a respawn countdown of length dependent on how one-sided the battle currently is. Instead it all comes down to objectives and scoring the most points. 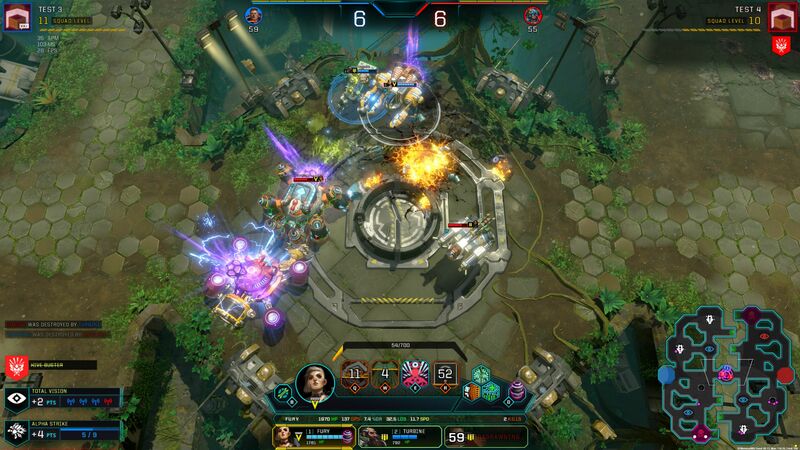 Dropzone takes more of a moba jungling approach to experience gain, with very zerg-like creatures known as the Kavash existing around the map to battle. Killing these monsters can net you some initial experience, as well as the most important item in the battle, Kavash power cores. Each of your three pilots can pick up and carry one of these items, with the goal of dropping them in the central upload link to gain a point and serious experience rewards. As you’d expect though, dying drops the power core for anyone to pick up, and the upload process can be interrupted. Nay I should say it almost will be interrupted as the upload process is about as subtle as firing up a 1990s router at 1am without your parents knowing. Unless your foes are terribly out of position going after objectives on the fringes of the map, you can likely expect at least a decent team battle every time you push in for a score. Also while the Kavash might drop three power cores at a time, you can only upload a single core at a time. So getting ballsy and going for three at once is about as brazen as flashing your red cape at a bull. Just in this case, you know, it’s a mechanical bull, with lasers and stuff. Now if you think those mechanics are way too much MOBA and not enough RTS for your taste – rest assured, RTS is alive and well here. See the power cores are not the only means for scoring points. Various randomly chosen objectives in the form of mini-quests are available in each battle to make the outer objectives and varying playstyles more viable. 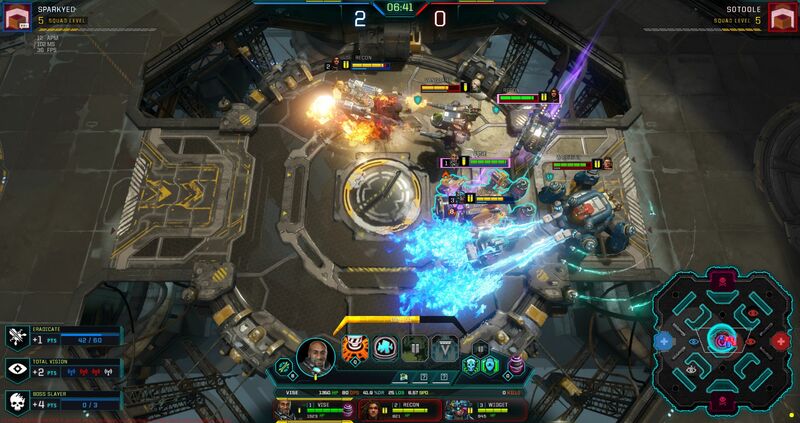 The fact that both players get the same quests and are forced to race each other to complete them adds a new layer of competition where the RTS fans with skills at micromanaging multiple units can utilize their APM madness to put MOBA players at a disadvantage. 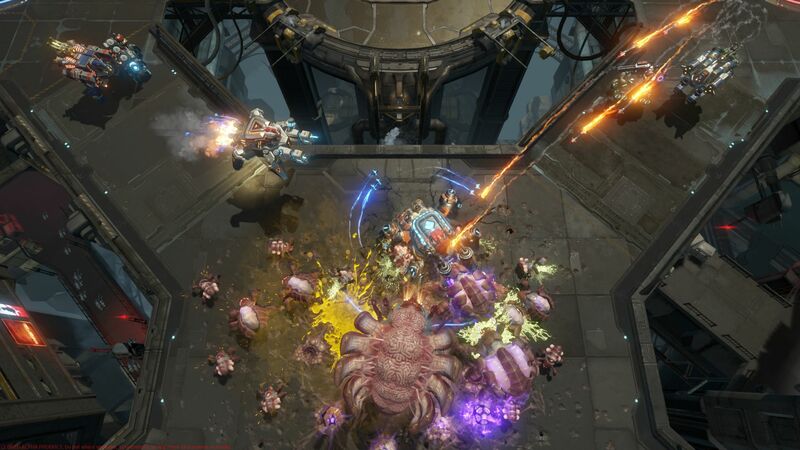 A few examples involve killing X Kavash, capturing and holding all four ward-like capture points at once, taking out the major Kavash boss first, mapping the full map, or other similar possibilities. It’s all still very much a work in progress so I wouldn’t be surprised if new elements, or different objectives on new maps are in testing. 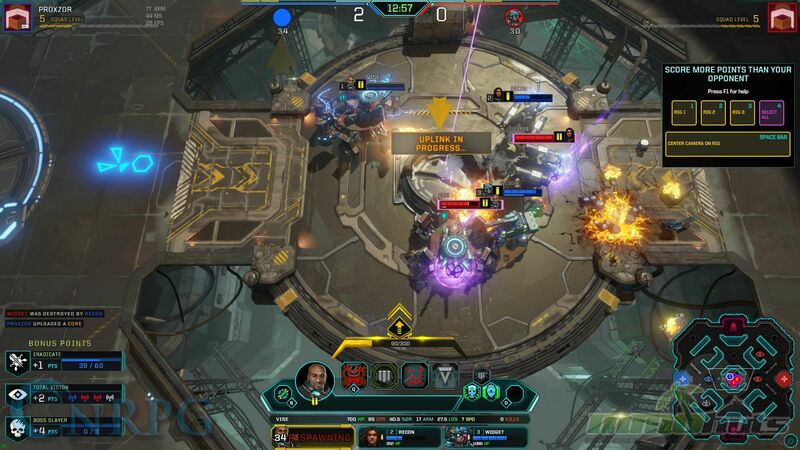 Back on the MOBA side of the spectrum, Dropzone has an intriguing mix of RTS planning with MOBA personality. Keeping things nice and RTS rock, paper, scissors, there are only three primary classes you need to worry about. The Gunner (DPS), Tank (AoE damage and CC), and Mechanic (Healing and ally buffs). That said, two more classes are in testing which will bring the total to five coming by open beta. However choosing a class is only the beginning, as a variety of pilots offer unique skills and base stats to differentiate their corner of the holy trinity (currently 3 per class with plenty more on the way). As you play and unlock currency, you can then acquire parts to further modify your abilities, passives, and other interesting actives and stats for further diversity. As you’d expect in RTS fashion, knowledge is power. The more you recognize a pilot being capable of, the better you will be able to counterplay them. And that’s where the unique team-based experience system comes into the spotlight. Your rigs at the start of a battle lack much of their potential. The gear you equip comes into play by letting you choose exactly when your trump card super moves come online, with the later stuff really bringing the pain. This leads to the possibility of building your full team around powering up a single unit with truly advanced gear for an end-game stomping. Or you could create a mid-game focused team that crushes your foes into submission in team fights, forging an unstoppable lead. Just beware as putting all your eggs in one basket can end badly should your enemy pack a hard counter against that unit’s style. And an RTS player will find ways to circumvent their foes by dividing and conquering the map rather than engaging in head-on conflicts. Sparkypants’ custom built Sparkle Engine makes all this possible with fast tab swapping hotkeys to let you quickly command your array of four abilities on three characters in the hectic team fights. 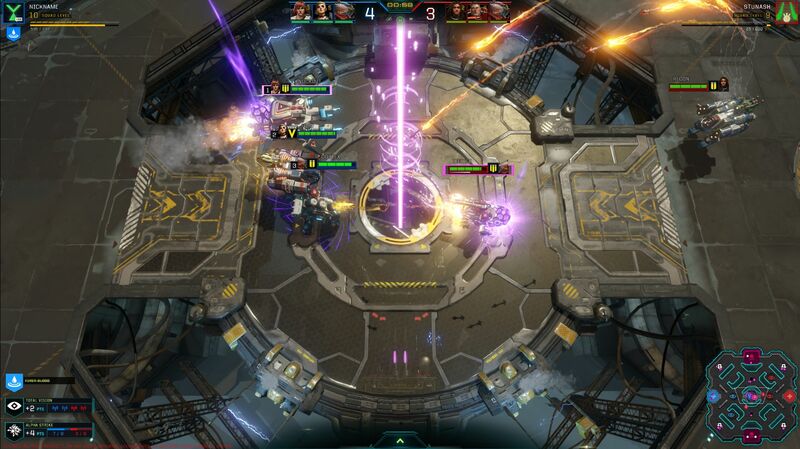 Pacing of combat in Dropzone is much slower than the pace of most MOBAs on the market, feeling closer to RTS juggernaut units clashing. This gives you time to see the tells of your enemy, move units to react and counter, and take the time to line up skill shots without losing efficiency in battle. The maps are small enough that conflict is constant, ensuring that even the brief 15 minute time limit will still be action packed from beginning to end. The Kavash evolving in strength alongside the player’s means that no matter how far in the lead one player gets, they are always susceptible to a well timed counter-strike by the trailing team. Everything just feels so polished and ready to roll for such an early stage in alpha. It’s clear that the immense talent on the team combined with their daily employee versus matches with the full team observing and taking notes has produced solid results. 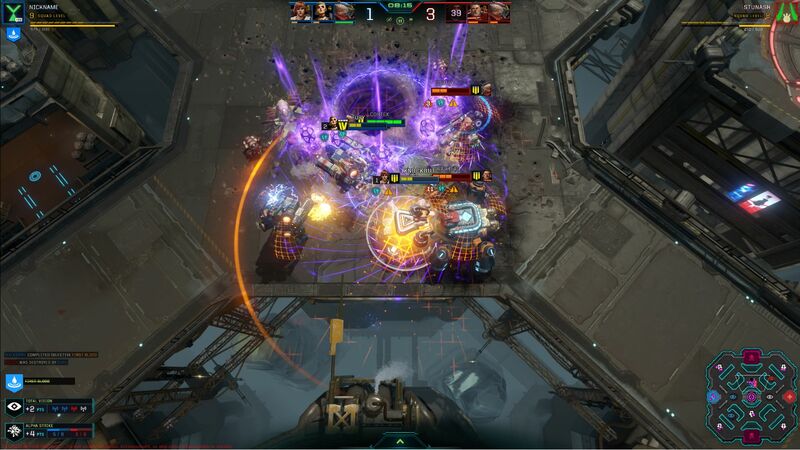 I’m still not sure if the MOBA RTS hybrid genre has a demand in the market, but if it does, Dropzone has all the elements needed to make it happen. Testing is expected to expand beyond the friends and family beta in a short number of weeks, so be sure to keep an eye out for continued coverage right here in the very near future.